Crazy, stupid, fun. That is all I could think while playing the offering from Size Five Games (the makers of a game we reviewed long ago called “Ben There, Dan That!”) called “Gun Monkeys.” Now, I know that words like “crazy” and especially “stupid” typically have a negative connotation, but let me be clear that this is not the case today. Yes, this game is crazy, nearly certifiably insane. Yes, it makes little to no sense from a story perspective. No, none of that matters, because while I’m playing all I can do is laugh and have fun. What is the story behind Gun Monkeys that makes no sense? Well, if you really have to know, you are a CEO of a giant corporation who powers the world with the souls of dead humans, because there was an invention created which destroyed half the known universe. To retrieve the souls you send out heavily armed monkeys who are trained to kill…or something like that. If we’re being honest it was a little hard to follow and has nothing to do with the core of the game. 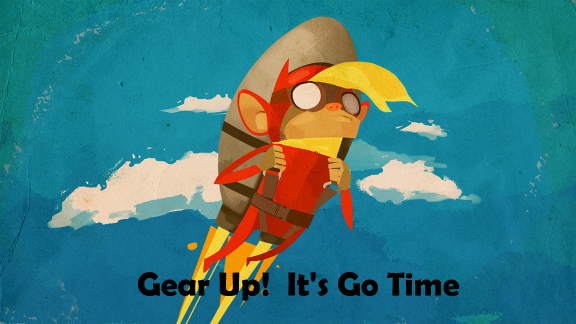 Gun Monkeys is made for online gaming with friends, or against opponents you’ve never met. 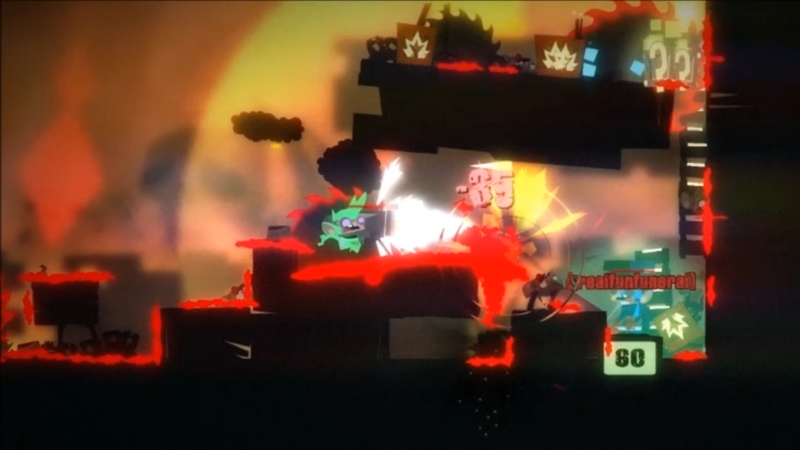 It offers a unique mix of platforming, one-on-one shooter, and a little bit of Bomberman into a neon colored arena of death and apes. Realistically, I find it hard to review this game as there isn’t much in my experience to compare it to, but originality is a plus in my book. The visual styling of Gun Monkeys is no monkey business. There are bright colors, abnormal shapes, and contrast that creates an ominous end of the world feel while not taking away from the light-hearted and lightning fast game play. Also, the physics used add to the feeling as you seem to glide and float in a low gravity environment. If there is one thing in this game that didn’t tickle my fancy (forgive me, I won’t ever use that phrase again) it would have to be the very apparent difference in skill level among the community. I, having just joined the ranks of violent monkey corporation CEO, had a difficult time for many matches as I challenged random players on the selected server. Nearly every player I challenged destroyed my poor chimp as I hopped around firing aimlessly and attempting to collect the small power cubes. Once I made it through the first few rounds (with an average of several negative points) I finally found myself matched up with another newbie and we happily bounced around the arena playing like two 4 year olds in a sandbox. We didn’t really know what we were doing, but we sure were enjoying doing it. I would recommend that you buy Gun Monkey with a friend or 2 so you have someone to learn with. As I stated earlier, this game is hard to compare to others, so getting the hang of a fighting platformer is a bit challenging. Having a buddy to play against while you learn the ins and outs is much more enjoyable than getting slaughtered at the hands of the community’s silver backs. Although I am not an advocate of monkey-on-monkey violence (breaking up a recent fight has gotten me banned from ever attending the zoo again), this is the kind of game I can really get behind. There is a definite skill curve and a good match involves little luck. Exactly what competitive gamers who need a break from the norm are looking for.